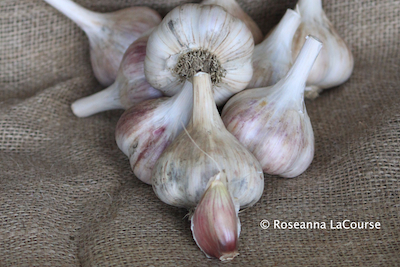 We chose this porcelain hardneck garlic for its large bulbs and beautiful, papery white skins. And of course, we love the fiery flavor. Its cloves (4-7 tall, fat ones) are a glistening tan streaked with maroon. Tall, majestic plants have swirly scapes and are very hardy. Stores well. Approx. 25-35 cloves per lb. Organic.